We are so excited to welcome Princess Lala Fireworks to our family! 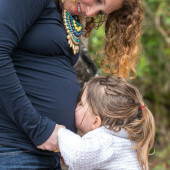 When we had Lucy, we were overwhelmed in generosity of gifts, and then we gave nearly everything away to friends and family who had babies on the way not knowing when and if we'd ever have another baby. Thank you so much for loving and supporting us!